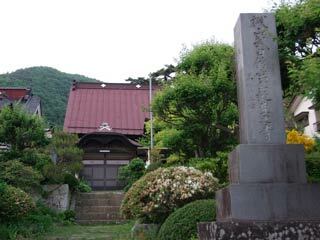 Sekisuiji Temple (積翠寺) is Rinzai Buddhist temple located in Kofu, Yamanashi. It is the famous temple for where Takeda Shingen was born in 1521. There is Shingen-ko's well which its water was used for his birth. This temple is located on Mt. Yogai which was the former castle of Takeda clan. The well is located on the back side of the temple. 1. use Bus to Sekisuiji Onsen. Sekisuiji was built by Jikuho during Kamakura Period. In 1521, the wife of Takeda Nobutora was evacuated in this temple from IIda battle, and she bore Takeda Shingen. There are Statue of Shingen and scripts from Emperor Nara.